It was an exciting “Week Two” of our move into the new Community Memorial Hospital Ocean Tower! 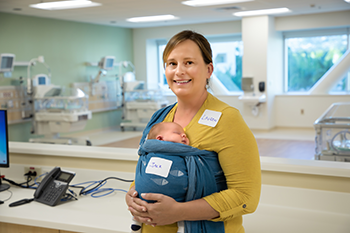 With so much equipment to install, so many staff and physicians to train, and a ton of furniture and other supplies to move in to the building, it was nice to take a bit of a break this week to celebrate everything we’ve accomplished thus far and welcome some of our first visitors from the community into our new hospital! We had a chance to gather our management team in the new Ocean Tower Cafe dining room to celebrate taking official possession of the new hospital and thank everyone for their dedication and support during the building process. Chef Brian prepared dessert platters for each manager to take back to their departments so ALL our physicians and staff could be part of the celebration! At just six weeks old, baby Jack is the youngest visitor (so far) to our new Community Memorial Hospital! He and his two older siblings were all born at CMH. We also hosted a mixer for the Ventura Chamber of Commerce! This event was the first in a series of open houses to showcase YOUR new community hospital. The Chamber mixer included hors d’oeuvres on the Ocean Tower Cafe terrace, comments from Community Memorial Health System President & CEO Gary Wilde, and comprehensive tours of the new hospital! We also welcomed our youngest visitor, baby Jack, to the Ocean Tower! Our CMHS Champions have learned everything there is to know about our new Community Memorial Hospital and are excited to pass their knowledge along to attendees at our community open houses! As we prepare for a number of events to introduce our new Community Memorial Hospital to our community, we want to acknowledge and Thank our CMHS Champions! 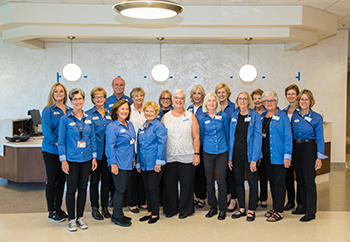 This incredible group of volunteers has devoted hours learning the ins and outs of our new hospital so they can provide tours and other support for our opening events. We have some great events in the works, and we wouldn’t be able to do it without them! We want everyone to come see YOUR new hospital! CLICK HERE for a schedule of upcoming public events, and be sure to SUBSCRIBE to the CMHS NewsBites Blog and LIKE US on Facebook for more behind the scenes access as we continue our move into the new Community Memorial Hospital!